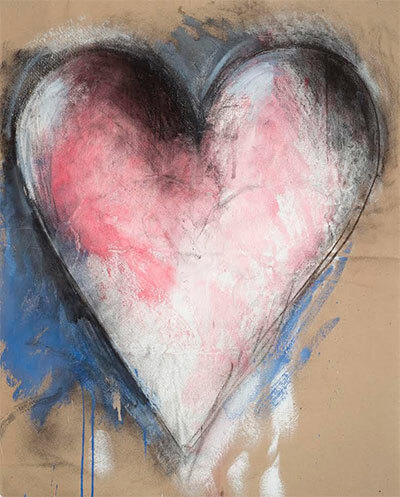 Jim Dine, Projection design for Salome (detail), 1986. Charcoal, acrylic, and spray paint on paper. Collection of the McNay Art Museum, Gift of the artist. A hand, a conch shell, a pair of lips, a valentine heart: Rendered in pastels and lined up along the gallery wall, they possess an eerie mix of starkness and sensuality. Artist Jim Dine has shaped their contours in black that looks hewn more than painted. But these two-dimensional sculptures draw their unsettling power from a second ingredient. Washing over the black, pale pink injects a faint reminiscence of the passion bound up in symbols such as the lips and heart; the faded-rose tint suggests a surreal parallel between the lips and the conch shell’s mouth. The American innovator’s haunting paintings symbolize the passions that erupt in Richard Strauss’ opera Salomé, a biblically-inspired thriller depicting a Judean princess consumed by lust. Nearly three decades after Dine’s performance-art happenings helped make his name, Houston Grand Opera enlisted him to design the set and costumes for a 1987 staging of Salomé, and the paintings and costume sketches that fleshed out his vision unleash their own drama in Jim Dine: Salomé Reimagined, running through Dec. 24 at San Antonio’s McNay Art Museum. Based on Oscar Wilde’s eponymous play, Salomé climaxes with the deranged princess singing rapturously to the severed head of John the Baptist, the object of her obsession. Dine’s pastels echo that collision of power and decay. The largest images stand five feet high, and in the most evocative—such as the eagle posted at the entrance to the museum’s Tobin Wing—sweeping brush strokes surround patches where Dine let paint run down the surface, as if the image is wasting away. 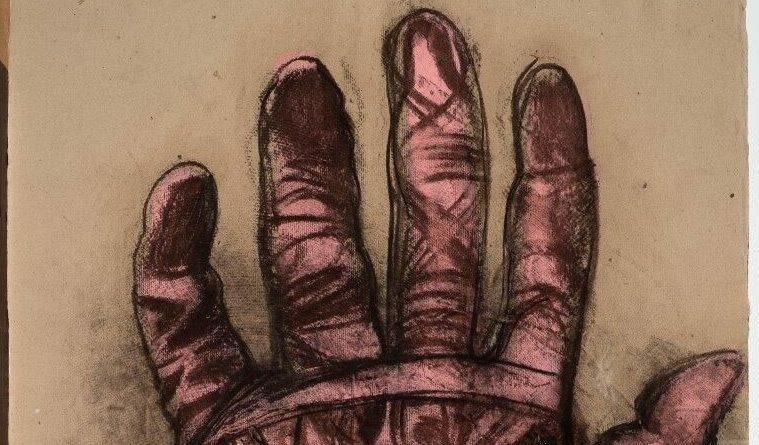 “What I love about these is that he uses some of the basic drawing techniques you might learn in introductory or intermediate drawing— focusing on a single object, and the techniques for making something (appear) three-dimensional and come to life. … Yet they’re ravishingly beautiful,” says Jody Blake, curator of the Tobin Collection of Theater Arts. The archive, housed in the McNay, is a treasure trove of theatrical design. Begun in the 1950s by Robert L.B. Tobin, a San Antonio philanthropist whose first love was opera, it comprises more than 10,000 drawings, renderings, books, maquettes—models of stage sets—and other items. 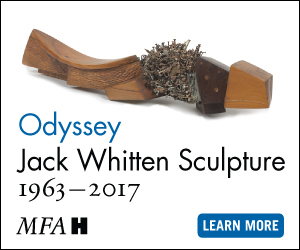 The holdings range from 400- and 500-year-old design anthologies to works by Dine, David Hockney and other artists of today. An endowment Tobin set up before his death in 2000 helps the collection keep growing, Blake says, and donations from elsewhere have enriched it further: The estate of the late Desmond Heeley, designer of scintillating Houston Ballet productions including Ben Stevenson’s Nutcracker, recently donated his sketches and other materials relating to them. “I hope to do an exhibition highlighting that gift,” Blake says. 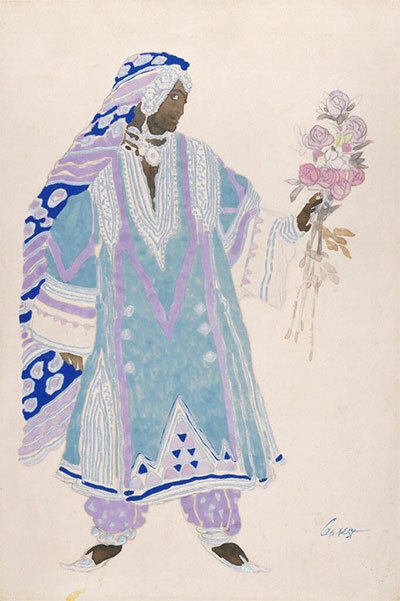 Léon Bakst, Costume design for Indian with a Nosegay in Aladin, ou la Lampe Merveilleuse (Aladdin’s Wonderful Lamp), ca. 1919. Watercolor, gouache, and metallic paint on paper, mounted on board. Collection of the McNay Art Museum, Gift of Robert L. B. Tobin. By displaying Dine’s Salome paintings alongside photographs of the performances, Salome Reimagined reveals how he and stage director Francesca Zambello transported his visual storytelling into the theater. Dine’s imagery centered on seven symbols—some of them longtime motifs in his work—that resonated with the opera’s characters and situations. Zambello, who will lecture on stagecraft at the McNay on Nov. 3, marshalled the symbols much as Strauss wove musical leitmotifs throughout his score. Dine’s rendering of the Venus de Milo symbolized princess Salomé’s physical allure, Blake says. The Valentine heart illustrated the ardor of a young soldier so smitten with Salomé that he kills himself in desperation. The age-old Christian symbol of the fish represented John the Baptist, and when Salomé imagined kissing him, the lips appeared. Those and the other key motifs glowed on a scrim as the opera began, and individual images were projected onto the set when they harmonized with the goings-on. A conch shell with its mouth opening forward formed a come-hither belt buckle on Salomé ’s costume; when the deranged princess performed her ‘Dance of the Seven Veils,’ each fabric panel contained one of Dine’s symbols. 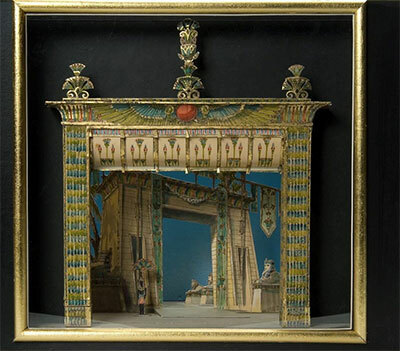 Helen Pond and Herbert Senn, Maquette for Triumphal March, Act II, scene 2, in Aida ca. 1980. Watercolor, ink, and metallic paint on paper and board, with wood, metal, and plastic. Gift of Robert L. B. Tobin. A complementary show, Orientalism: The Middle East Onstage, fills the Tobin Wing’s library gallery with contrasting views of the region in which Salome is set. Extending from 16th -century productions of long-forgotten works to modern-day stagings of Mozart’s The Abduction from the Seraglio and Giuseppe Verdi’s Aida, the depictions of settings and attire range from relatively realistic to exuberantly stylized.